Leading technical magazine for renewable and conventional power generation, transmission and distribution in India is published nine times each year. Energetica India magazine is published 8 times in a year, of which energetica-india.net is the online website, preferred by the Industry Professional on a global scale. We have a reputation for providing excellent market information and a unique focus on the relevant technical, scientific and business happenings; our publications are an appreciated tool for industry decision makers from all over the world. The advanced media platforms of our company allow an overall presence through conventional channels as the printed magazines, and also alongside strong worldwide online distribution through our regularly updated databases. 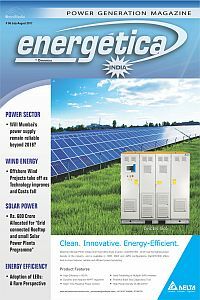 Energetica India concentrates on covering the Renewable & Conventional Power Generation news with its unique, technology-focused reporting, up to date technological trends and the worldwide market reach. Energetica magazine India is the sister concern website to Energetica USA, Energetica Spain, and Energetica Latin America.